In 1440, Japan was in the middle of its Muromachi Period, the early stages of the violent Sengoku, or warring States period, where short, localized provincial wars continued to erupt. To mark and control territories, many hundreds of castles were built. 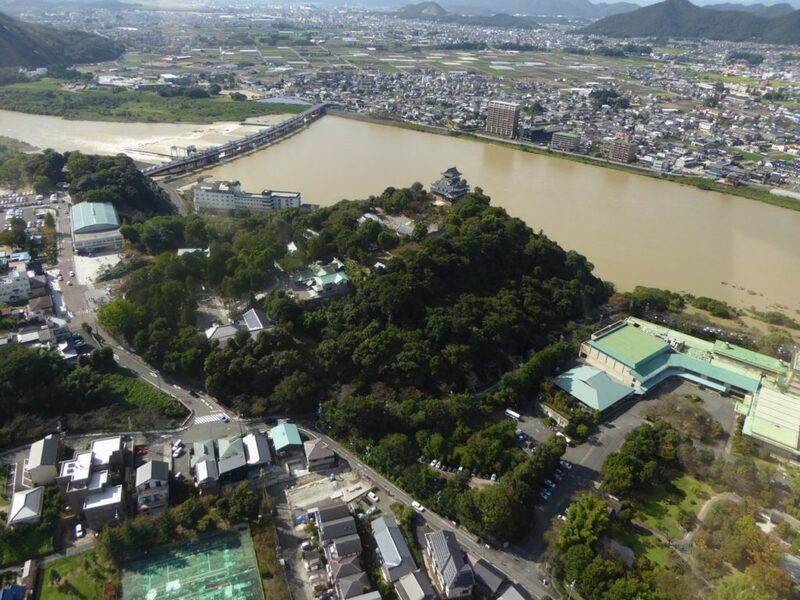 One local warrior took advantage of the 85 meter high wedge shaped hill known as Inuyama, strategically surrounded by a natural moat, the wide, fast flowing Kiso River running around and below it, and with clear views of the wide Nobi Plain and the ancient lands of Owari (Western Aichi) and Mino (Gifu). Almost a century later, in 1537, the hill and fortress, also known as Hakutei Castle, were taken by Oda Nobuyasu, grandfather of the great Oda Nobunaga. 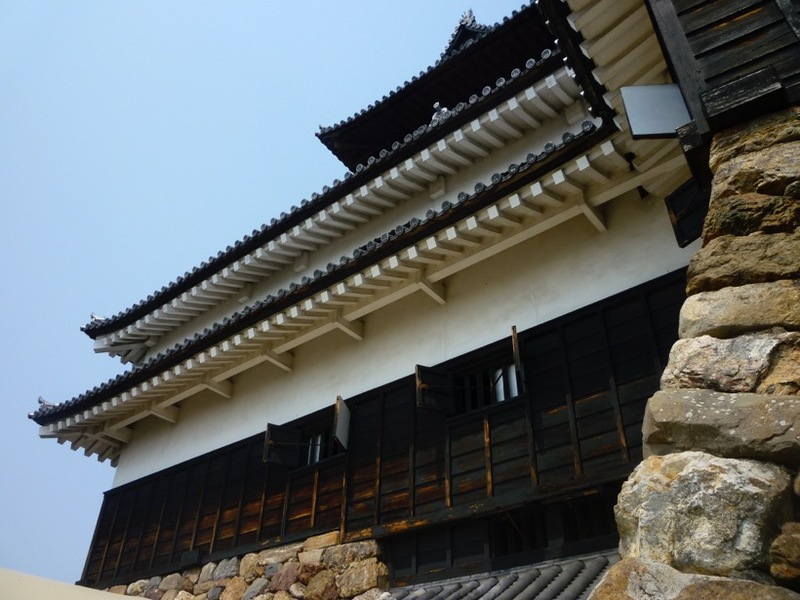 Under the Oda clan, Inuyama’s strategic importance was acknowledged and a larger, sturdier, more elegant castle was constructed. It was the first castle to be owned outright by Oda Nobunaga, although he would leave his uncle as a caretaker while he went off to fight more battles. 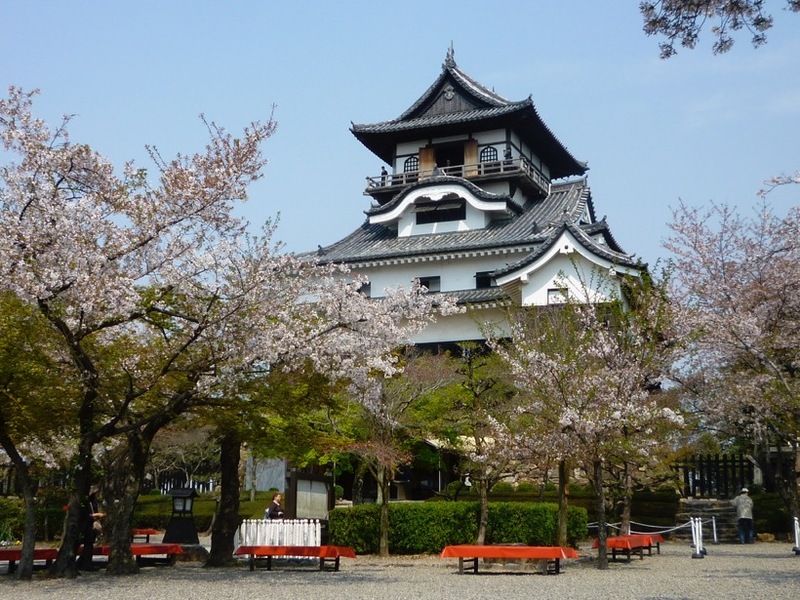 Classified as a Hirayama-jiro, the oldest of the 12 castles remaining in original condition, Inuyama Castle in Aichi Prefecture seems small compared to many other castles, such as Nagoya or Osaka castles. Its stone walls stand just five meters in height, and the tower itself a mere 19 meters on top of that. Total floor space of the defensive tower structure is around 699 square meters, (about the same as Hikone Castle) which is quite large for a keep of those days. What remains is just the keep, the main watchtower. The lord’s living quarters once stood on the wide flat area along the lower slopes of the mountain, which was covered in fortifications. Turrets, barracks, walled corridors and related buildings once surrounded this and the entire mountain. 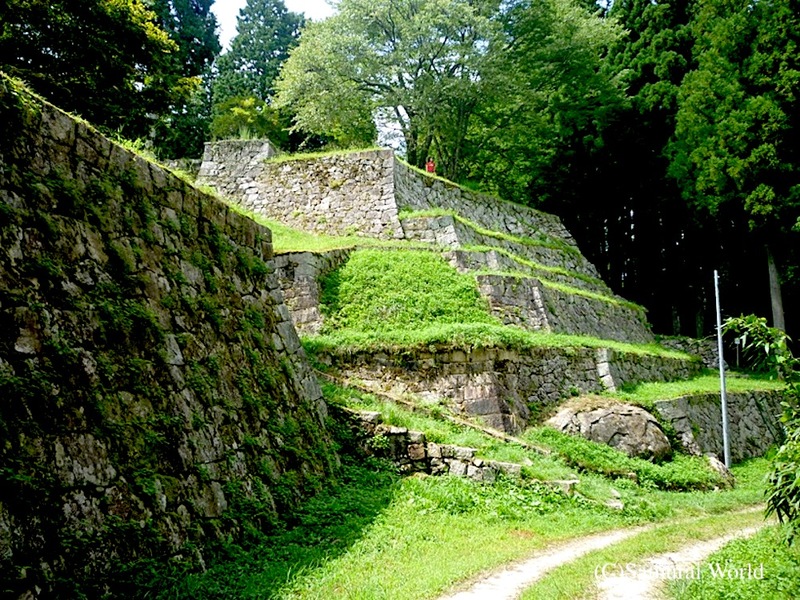 Inuyama had nine yagura watchtowers around its perimeters, and two main, and six smaller gates protecting the Honmaru. 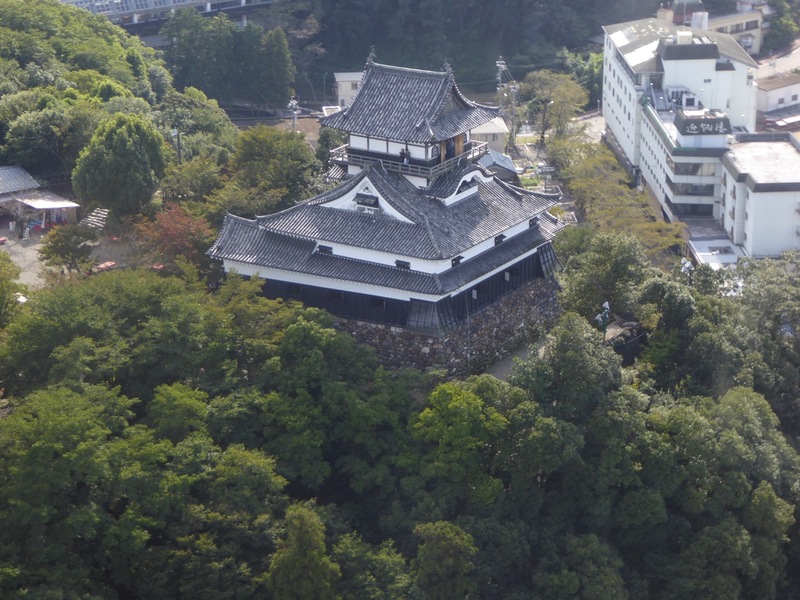 Most castles name their kuruwa, or precincts as Honmaru, Ni-no-Maru, San-no-Maru etc., however Inuyama Castle’s five baileys were named after trees, with the Honmaru at the top, and the lower slopes consisting of the Sumi, Momi, Kiri and Matsu kuruwa. The architectural beauty of the castle is evident inside and out. 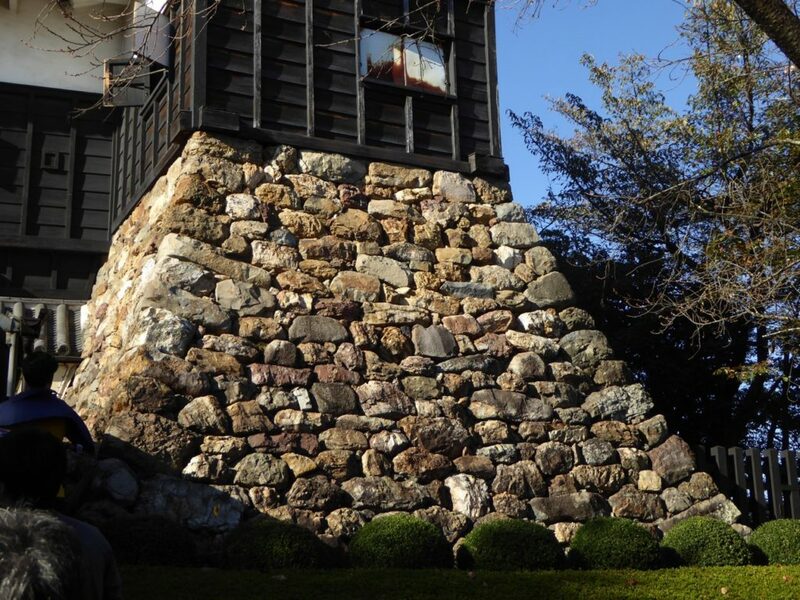 The tower is a four story Borogata type keep, with entry via the smallest anakura, (being a basement within the dry stone base of the keep) of all the castles in Japan. Steep stairs, built just to not only save space, but hinder any armor clad invaders and make defense of the castle easier, take you to the spacious first floor. The keep appears to have been constructed in a square shape, yet the northeastern corner features the widest open angle of any keep across Japan. It is believed that the keep’s angled eastern wall provided better views, as well as increased firing range protection along the eastern flank. 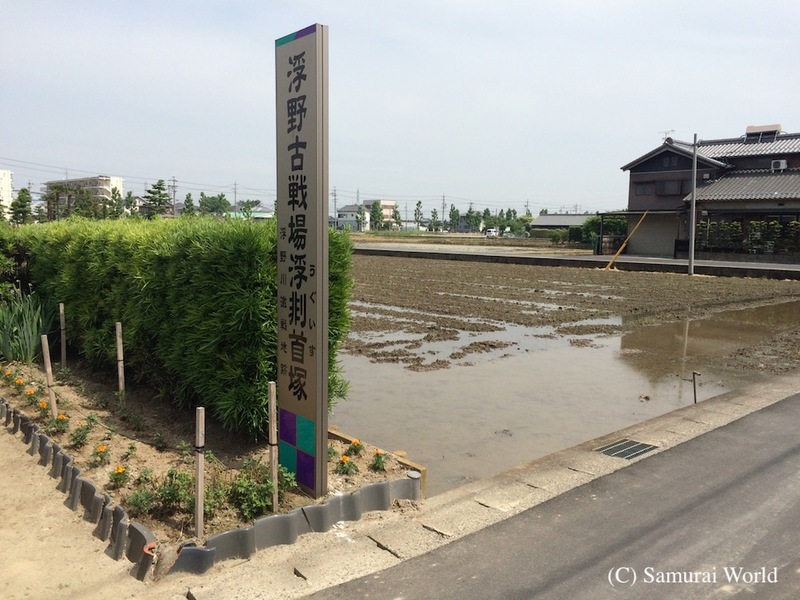 The first floor is divided into a number of rooms, one such room, the Jodan-no-Ma was the lord’s official audience chambers, an office of sorts where meetings were held with the various retainers, and official administrative duties performed. It is rare to find the Jodan-no-ma in the tower keep. Most were located in the lord’s official residence and office within the goten, or yashiki, the palaces used by the lords rather the keep. The Jodan-no -ma features a set of doors hidden in the wall. According to the official explanation, behind those doors, the lord’s bodyguards lay in wait. This is not quite correct. 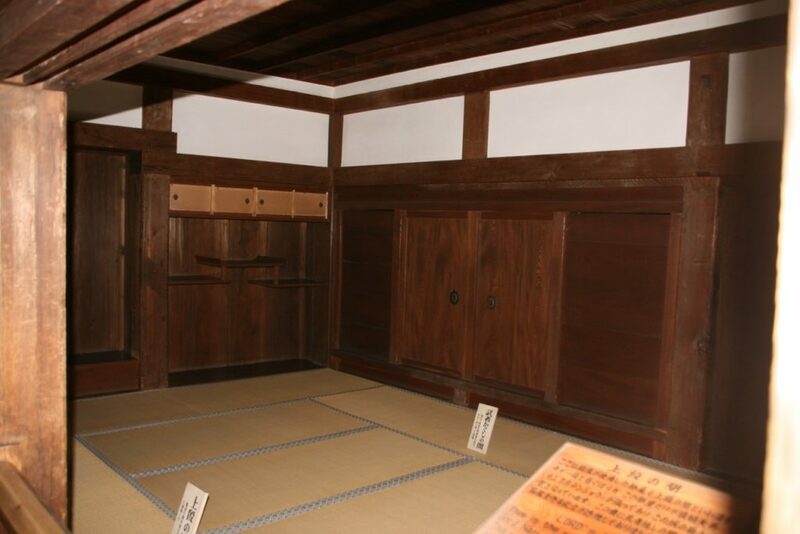 The eight-tatami-mat sized space was in fact both a storeroom and private retreat for the lord of the castle. Wide corridors called Musha-Bashiri (warrior running corridors) around these central rooms allowed the castles’ defenders ample space to move in times of attack. 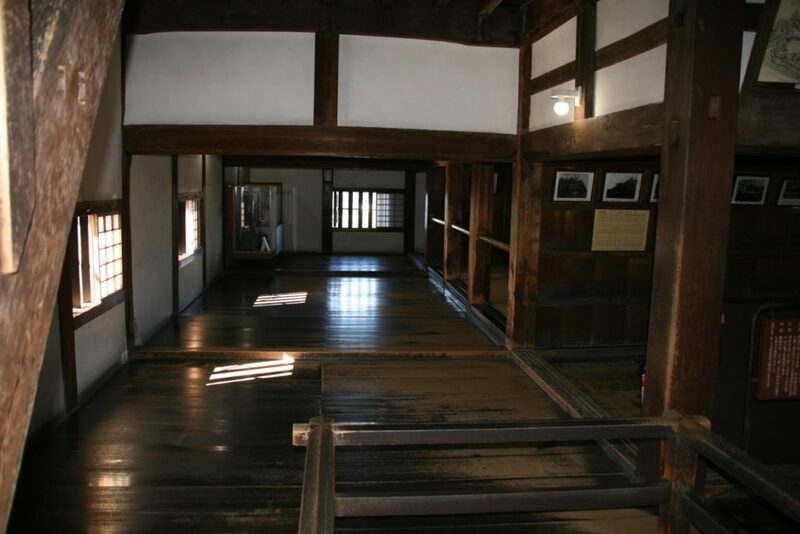 The first floor Musha-bashiri has six places where fusuma (sliding doors) once stood. This style is very old, and probably would have been similar in Oda Nobunaga’s fine Azuchi, and Toyotomi Hideyoshi’s Osaka Castles. Interestingly, having these fusuma at six places around the Musha-bashiri would in fact hinder the warriors movements, preventing them from actually running around the central area, as sliding doors would get in the way. 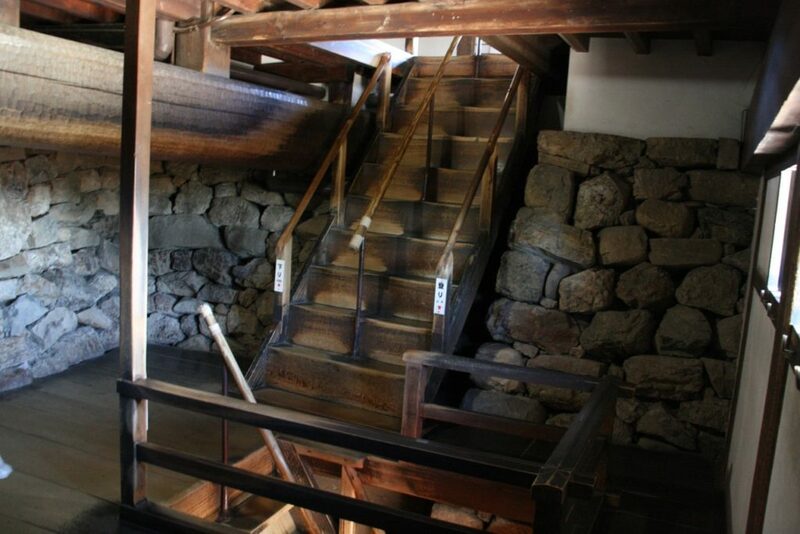 Climb a floor, along the longest straight staircase in samurai castle history, to find the armory where arms and armor were stored ready for any attack. The third story also features high, wide outer corridors to allow warriors enough room to run with weapons, in particular the samurai longbows. Above that, small balconies concealed under triangular eves called hafu provide fine views of the river and mountains, and places to shoot from. The fourth floor consists of a wide chamber, surrounded by a low balcony providing spectacular views of the surrounding area. The mid section karahafu decorative curved roofing element and extended yagura watchtower were added during the Naruse years. 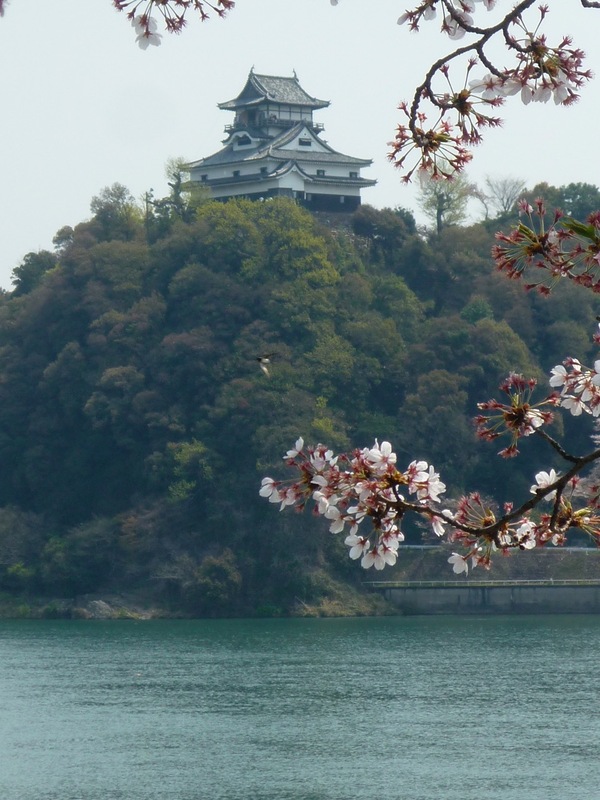 Inuyama Castle saw a great deal of action. 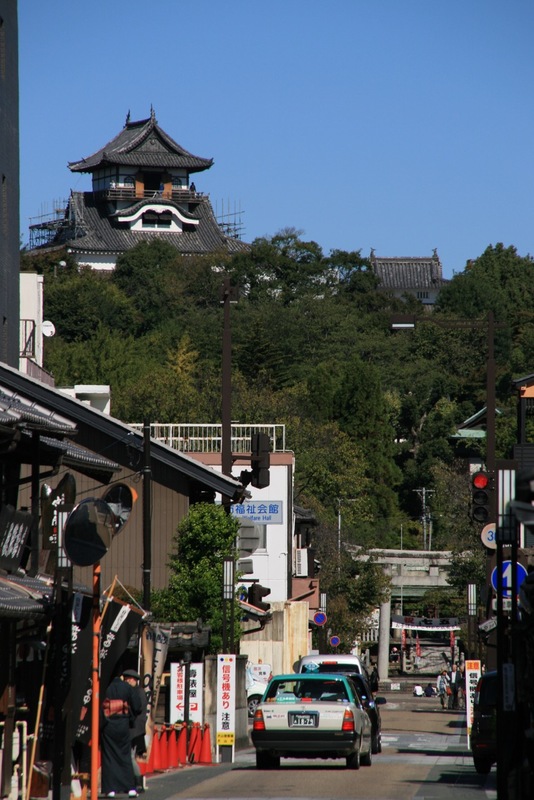 Inuyama was the base for Toyotomi Hideyoshi when fighting the Battle Of Komaki-Nagakute against Tokugawa Ieyasu in 1584. 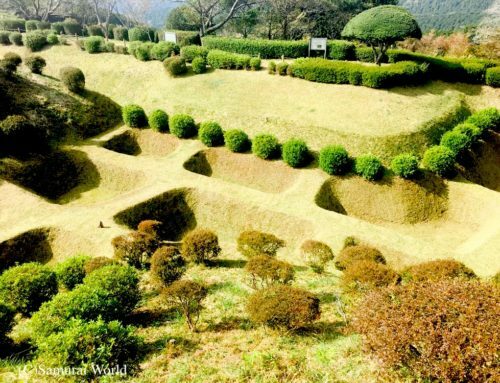 Hideyoshi and some 120,000 samurai entered the castle just north of Ieyasu’s forces at Komaki castle, and from there commenced the attack. In 1600 it was threatened during the great battle at Sekigahara. 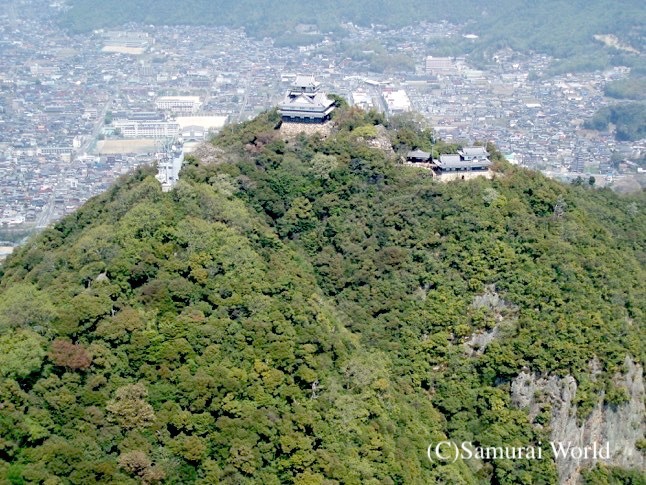 Until the night before Sekigahara, 27-year old daimyo, Takenaka Shigekado had been a member of the Western loyalists and was holding out in Inuyama Castle. His gut feeling was that the West would lose at Sekigahara, and so he defected to the East with his remaining 100 samurai. Following Takenaka’s lead, Ishikawa Sadakiyo, the lord of Inuyama, secretly made a deal with the Eastern forces not to participate, thus protecting the hind quarters of the Eastern advance, and the future of the castle itself. 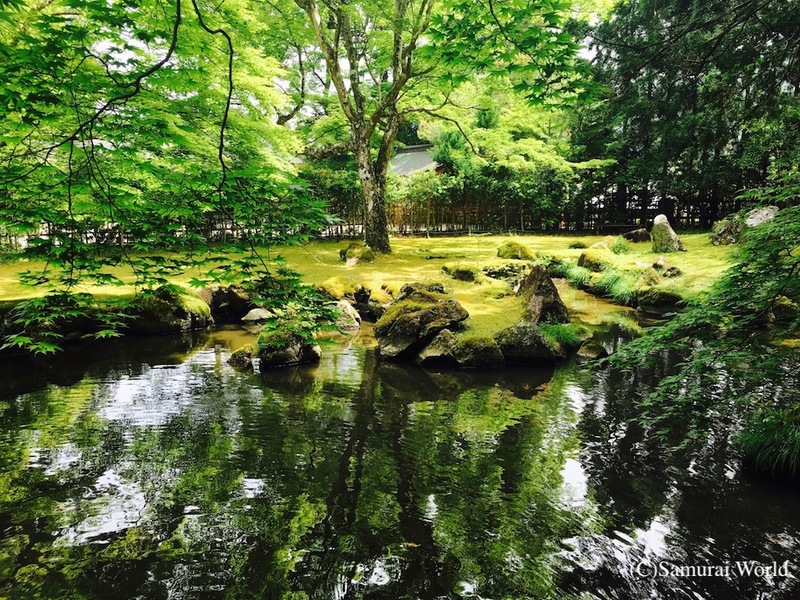 The castle went through a succession of lords before Naruse Masanori was installed there in 1617. 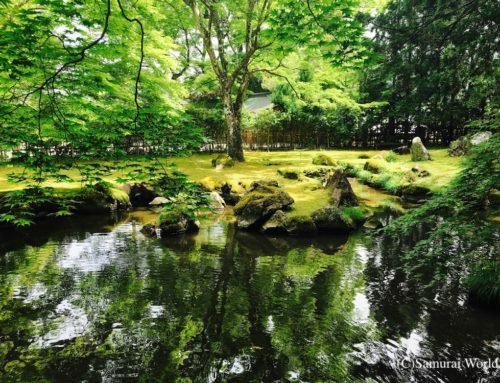 From then, the castle remained in the successive hands of the Naruse family. In 1871, three years after having shrugged off the feudal system, most of the castles’ outer walls and surrounding buildings, including armories, warehouses, defensive turrets and barracks, were destroyed or removed. The main keep and a few outer turrets were kept, but most of those were destroyed 20 years later in the 1890 Great Nobi Earthquake. Following the quake, the main keep and mountain itself were handed back to the former Lord Naruse on the condition that he undertake repairs to the castle. 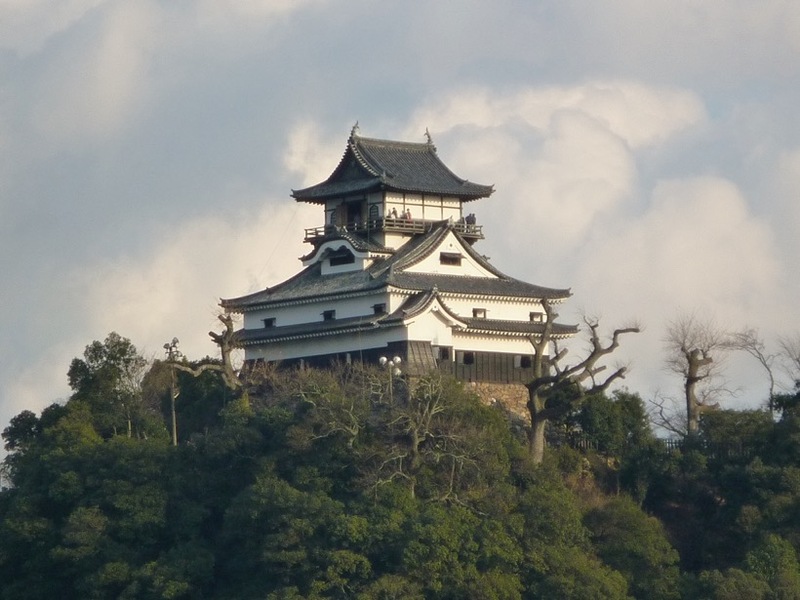 This was achieved, and some 30 years later in 1935 Inuyama Castle was designated a National Treasure. Inuyama remained in the private care of the Naruse family for 12 generations until 2004, when it was handed over to Inuyama City and a new overseeing foundation. 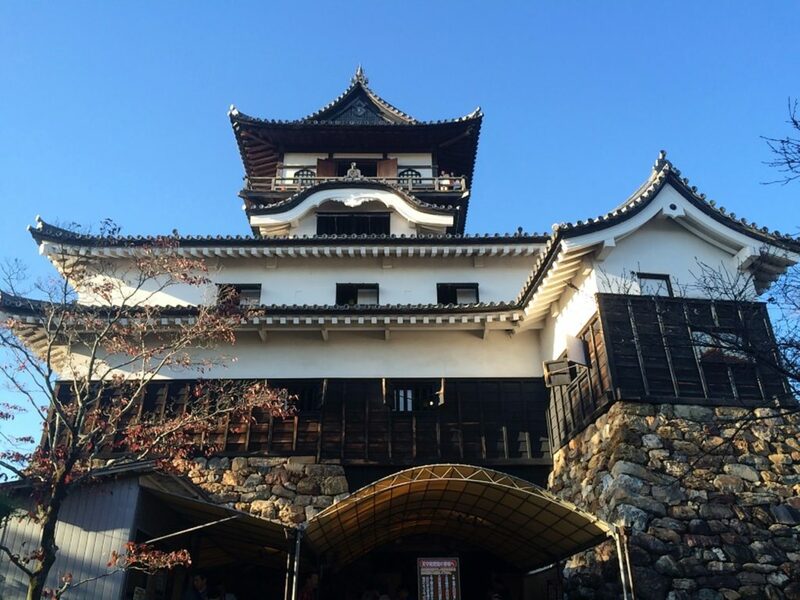 Inuyama Castle is a fine example of 16th century castle architecture it’s a treasure the residents of Inuyama City are rightfully proud of.